Today’s consumers want frictionless service and are loyal to businesses who meet their growing demands for fast, relevant and seamless experiences. But businesses are finding it difficult to keep up with the rapid change in technology. With growing innovations such as voice assistance and AI raising the proverbial stakes, marketing decision-makers face the daunting task of exceeding consumer expectations. However, the bigger challenge is building an organization and culture that support this mission. 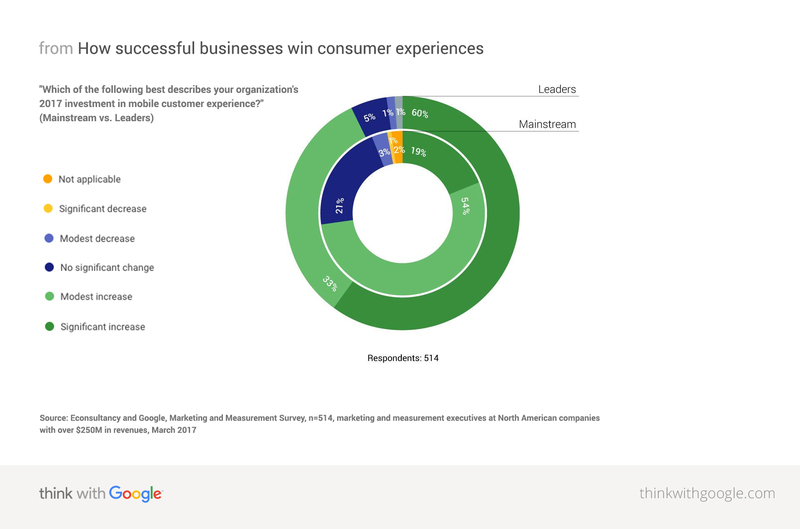 Google recently partnered with Econsultancy to uncover what leading companies are doing to build great consumer experiences. In this research, we interviewed more than 500 marketing and measurement executives at North American companies with over $250 million in revenues. Leading companies are those that significantly exceeded top business goals in 2016. Mainstream companies make up the rest of the sample. Recognize the value in aligning teams across the organization around a single view of the customer. Use first- and third-party data to create personalized and assistive experiences for users. Understand the business impact of speed and are aligning teams and metrics to support it. Read on for more insight into how these key attributes help top marketers stand out from the rest. How are companies investing in mobile customer experience? But many multichannel organizations are still organized around media budgets or functional skillsets, where each step of a customer journey is handled by a separate team with their own KPIs. The digital team manages the digital experience, the retail team oversees the customer journey in-store, and a mobile team may own the mobile app. But who’s guiding the customer journey across these experiences? Successful organizations are increasingly seeing the value in building customer-centric models that address the whole journey, and are building teams that solve for end-to-end consumer experiences across channels and devices. This focus is carried through across planning, strategy, and ultimately, the outputs of the team. Leading marketers are 39% more likely than the mainstream to strongly believe that anticipating customer needs and providing assistive experiences along the customer journey is critical to growth [download].2 Success in these areas requires access and understanding of data that supports a customer-centric approach. With the use of first-party data—such as tapping into purchase history—leading marketers are able to create unique content, products and services for users. Supplementing that first-party data with third-party sources helps inform a more holistic picture of their customers, and is a critical boon to business. But even with the plethora of data available to marketers, making sense of it all can be a challenge. That’s why leading marketers are 46% more likely than mainstream marketers to increase investments in capabilities [download], like machine learning, which can predict customer needs.3 Businesses are starting to rely on technology to do the heavy lifting when it comes to data analysis and application. From dynamically served email and mobile content to programmatic media buys, marketers are finding new and innovative ways to drive relevance at scale. Consumers are impatient—and we can’t blame them. Technology is enabling faster, almost instant, experiences at our fingertips. As a result, mobile speed is now table stakes for any brand looking to compete on mobile. But speed isn’t just a developer’s problem or a marketer’s problem—it’s a business problem. And organizations that understand the business impact of speed are the ones reaping the benefits. 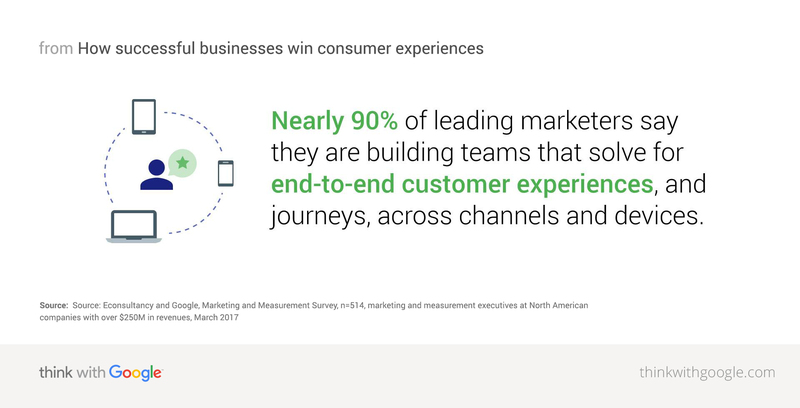 Learn more about driving growth for your business from the Google/Econsultancy study, Leading in Mobile Customer Experience. Discover how you can inspire consumer loyalty for your business. 1-5 Econsultancy and Google, Marketing and Measurement Survey, n=514, marketing and measurement executives at North American companies with over $250M in revenues, March 2017.